There are some very outspoken views about this subject, but I rarely hear the one that clearly resonates most with the average person. Therefore, I'll just go ahead and say it: "who cares?" Yes, the evidence is pretty solid. Yes, the effects could be large. But who says it'll be bad? I, for one, like warm weather. Sure, the oceans will get a little higher. People can move. Sure, there may be a few more hurricanes. That's why someone invented hurricane windows. Since when have we been unable to cope with a little change in the weather? I, along with 80% of the rest of the world (according to a study that I just made up), don't want to waste what little time we have trying to solve problems that don't even exist yet. I am quite confident that polar bears won't go extinct anytime soon; so, everyone, lighten up a little will ya'? Standing on two feet is no great feat to most people you might meet; but, to an engineer, at least to this engineer, it is awfully cool. The first aspect of balancing involves our senses. We have to know that we are falling and how before we can correct it. That is where our ears come into play. Our inner ears contain fluid that moves and they can be used like accelerometers. Having two ears allows us to know whether we are translating or rotating. Next, we have our eyes, which are very adept at gauging the angle of the ground. Having two eyes also proves useful when distance to the ground becomes important, for example when falling. Our joints provide information about their current angles. 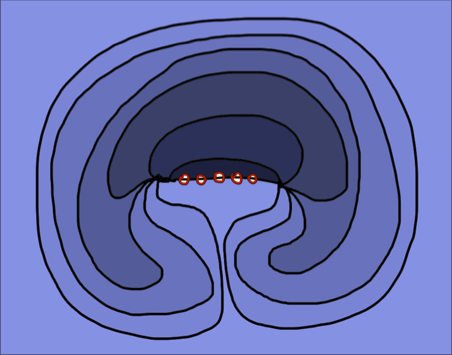 Finally, we have our sense of feeling at the bottoms of our feet that tell us the distribution of forces applied by the floor. All of these redundancies are employed to compensate for closed eyes, turning heads, running legs, slanted or bumpy grounds, and so on. Now that we know the exact position, velocity, and acceleration of our body, as well as the different derivatives of orientation, we must tighten and loosen the appropriate muscles to keep from toppling over like a rootless tree. One way is to use our calf muscles to change the center of force in our feet. Unfortunately, this only provides up to a "foot" of movement. We could shift our weight from one leg to another to shift the center of our base. We could contort our body in such a way that it changes our center of mass. We could rotate our arms to provide a counter-acting angular momentum. Finally, we could lift our legs and plant our feet in different locations to dramatically change our base position. If we are already moving we can simply change the direction of our motion to right ourselves like a rolling wheel. When it comes to human balance, there are so many senses to be tracked and options to be selected from in such a short time and with such precision that it would overwhelm even the most powerful computers. It is no wonder that football players are so difficult to knock over; actually, it is a marvelous wonder. Assuming that everyone always drives at the speed limit, we should be able to time the traffic lights down a stretch of road so that nobody ever hits more than one red light. Just make the lights change at a difference in time equal to the distance between the lights divided by the speed limit. but at least they're all green. Well, its not really that simple. What about the cars going in the opposite direction? What about the cars driving on the perpendicular roads? Is there a way that we could time the lights so that nobody ever has to hit them more than once? Maybe. Not for most roads, though. Can we optimize the timing? Maybe. Some roads have more traffic than others, which must be taken into account. It turns out to be a very difficult optimization problem with many local minimums. A genetic algorithm may work well, nonetheless. What if we don't assume that everyone is traveling at the speed limit all the time? People do take some time to accelerate before and after hitting lights. Also, different people drive at different speeds at different times of day and in different weather. 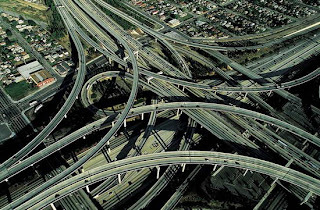 Some roads have more cars at different times and on different days. In addition, it is almost impossible to predict how people will change their driving in response to changes in the light timing. These things make the problem essentially impossible to solve on a computer alone. Maybe we need to use some machine learning. Have a camera installed on each light that can count the number of cars waiting. Then, change the timing of the lights every so often and see what works the best. Done. Well, not really. There is a concept in machine learning called "Exploration vs Exploitation" and it plays a crucial roll here. Like I said, this is a problem with many local minimums. Finding an optimum solution by merely watching the effects of the timing on the traffic could take years. We would be wasting valuable time with bad systems just to find the absolute minimum. We could combine the genetic algorithm with the learning technique. Start by calculating some optimum solutions with the genetic algorithm that assumes speed limit driving. Apply the best solution and then watch the flow of traffic. Learn where the calculations have gone wrong and why. Update the genetic algorithm. Continue to use the best solution from the algorithm, but continue to improve it via machine learning. This is much easier said than done, but many smart people are currently working on this problem. Maybe one of them will figure it out. Until then, take the highway. Wood is a great building material. It's fairly cheap. It's fairly light. It's fairly strong. What else could you ask for? Well, wood is a little weak in tension and very weak in shear. Being that it is very commonly used in bending, a great application of its large cross section, this can be a problem. The solution: reinforced wood. Essentially, wrap a steel mesh around the trunk of a young tree. As the tree grows larger, it will push through the mesh. Eventually, you will have an ordinary looking tree with steel mesh running through it. Chop it down and cut it up. Now, you have steel reinforced wood that is great in tension and shear and just about anything! I hate to infuriate the 75% or so of people who believe in some kind of god, but I am going to do it anyways. God can do the impossible. He is beyond reason, correct? Well, I'm not. I'm an engineer. I better have good reasons for everything I do. 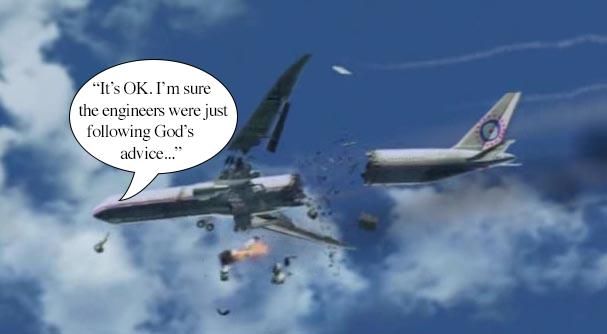 If I design a plane and it fails, I won't get much sympathy for claiming that God informed my decisions while making it. So, that's my philosophy about religion. If I can't use it as an engineer, why should I use it to engineer my life? When it comes to riding a bicycle, the old saying should be: "what goes down, must ride all the way back up." What if there was a place where you could always ride down hill? "Impossible", you say? Hck-Ptooey! I spit on impossible. 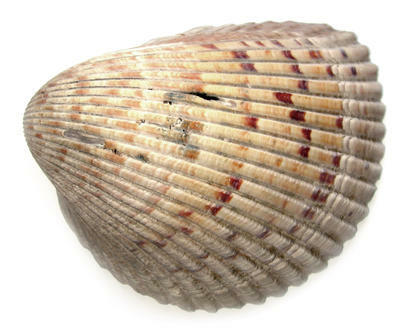 Imagine a hill that is shaped like a clam shell. Essentially, there is a cliff on one end and a shallow slope on the other that raps back around to the base of the cliff. Now, just put a few elevators along the cliff. of the clam-hill. 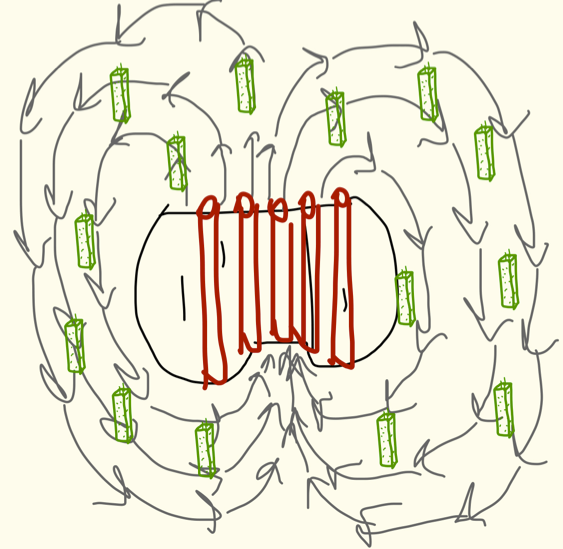 The red circles are elevators. The flow of traffic would always move downhill from the top of the cliff to the base. A flow chart... 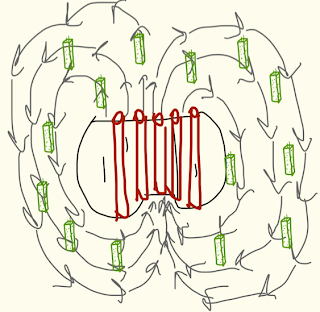 The red cylinders are elevators. The rectangular prisms are buildings. Now, that is a place where I would want to ride a bike! Obviously, it would only work for a small city, but it is still a really neat idea. As the geniuses amongst you may have figured out already, I am an engineering student. This means that I do lots and lots of work. Did I mention that I do a lot of work? What grinds my gears is that all the work I do is used for a total of zero useful things. Nadda. Zippo. 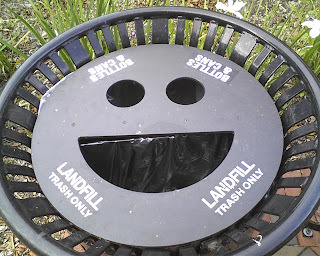 Straight into the smiling trash cans. "Me happy, because me love engineering student homework..."
In my fictional school, actual companies collaborate with professors to assign useful work to the students. Nonetheless, professors only give assignments that are relevant to the class and are useful in teaching the material. Otherwise, people might not want to take their class, which, in this school, actually has consequences. Students who do good work are recognized by these companies. Some even get paid to do it. Many use this recognition to get a job after graduating. It seems I have solved the "GPA/Degree" problem with room to spare! By "room to spare," I mean that I have also solved the high tuition prices problem. Teachers wont need to be paid much by students if they are being sponsored by companies. "Corruption," you dare say? Every student has a completely voluntary choice on the classes to take and the teachers to choose in my school! Why shouldn't they choose the class that is cheaper and might get them job offers? I have a B.S. degree in Mechanical Engineering. Does that make me an engineer? Your godamn right it does! Well, no. I'm an engineer because I believe I am! Not really. Ok, I'm not sure what makes someone an engineer. Either way, that's what I'm calling myself. Live with it.